I eat most of my three meals a day at work. Usually there's a Hershey Chocolate Bar with almonds somewhere in there as dessert. But lately I've been baking a pie a week and taking a slice in each day. The assumption is that it probably has a similar amount of fat and sugar, but at least the fruit will have some positive nutrient impact a candy bar lacks. Plus, I've started using some wheat flour in the crust, and using less butter in the crust. The combination makes for a bit of a crunchier crust, not so much "flaky," but it makes me feel better about having my pie. 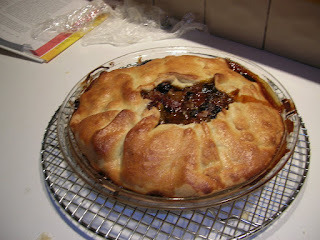 So I got a bit tired of apple pies (after buying 15 lbs at a farmer's market at $1/lb), so I thought it would be fun to make a denser pie out of dried fruit. I once read about a dried apricot pie with limoncello, which I think was the inspiration for this. We've been making a lot of muesli here for breakfast, so I had a lot of little odds and ends left over, so this is more of a mixed up collection of dried fruit. I put a cup of halved dried apricots into a pot with dried goji berries, dried blueberries (leftover from sauerkraut canning), dried figs (leftover from making a blue cheese torte), golden raisins, black raisins, and a cup of pistachios. To this mix I added 1 cup chardonnay, a splash of brandy, the zest and juice of one orange, some minced candy ginger, and an old, forgotten vanilla bean that shattered when I tried to cut it open. 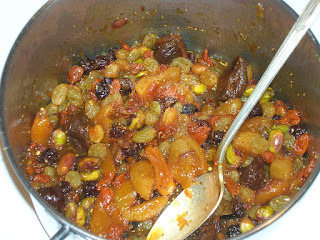 This all simmered for a bit to mingle the flavors. I assumed the dried fruit would absorb most of the juices, but to ensure a not-watery pie, I added a tablespoon of tapioca pearls I'd blitzed to dust in a coffee grinder. I'd like to say I let this fruit and nut mixture blend its flavors for 48 hours, but honestly I just forgot about it for two days. I rolled the pie dough out, rustic-tart style, in one big sheet and folded the edges in. The pie itself was really floral and aromatic, which I didn't expect. The fruit had become very soft, but the pistachios still gave it some crunch. The citrus also really came through, but that might have been re-enforced by all the dried apricots. Part of me thinks the pie might have been better served by a cookie-like tart crust, as the fruit was so full-flavored, dense, and intense. The pie crust worked well, but since this wasn't a juicy fruit filling, you might not need the crust to hold everything in. So if I was making this for a party, I'd go for a buttery cookie crust. That sounds really neat. What was the texture like? It kind of sounds like eating a granola bar wrapped in a pie crust, but I guess simmering them and then letting it stand softened everything? What was the consistency like compared to say, a regular blueberry pie? It's got a funny, pebblely texture. The fruits are soft, but still have a structural integrity, giving them some chew. But then you get little crunchy seeds from the figs and the nuts to break that up. But it's a pretty cohesive pie, with the ground tapioca holding it all together.